Professional ductless mini split maintenance offers plenty of benefits, only if you give your system regular attention. This isn’t an overwhelming job. It just needs should be consistent. A homeowner can do some light maintenance herself, but it is probably a better idea to get a professional to do the job. A ductless mini split is a sizable investment, you want to protect it. Why should you call us for maintenance? Yes, that’s right! The Mitsubishi Electric products are known for their high quality, our professional ductless mini split maintenance techniques are just the same. This is why our company continues to be highly recommended. Our view is that a maintenance is not only cleaning a system, but also making sure the we do our best to prolong its life and maximize efficiency. We have lost count of how many times we open a malfunctioning unit and find how poorly it was maintained. Simple logic: a sloppy maintenance leads to unnecessary, avoidable malfunctions and extra expenses. It is true. We have nothing to hide, and lots to show you! 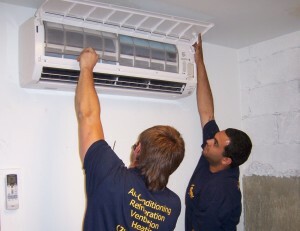 We offer professional ductless mini split maintenance, but if you find our technicians doing sloppy job, not paying attention to your ductless system, or even worth – to your personal belongings – we will make things right or refund your money.